Devoted to the Exposition of Nature, Physical, Spiritual, and Divine, and to Communications from the Spirit World. 1850-1850 Monthly (July and August), biweekly (to October 19), then weekly. 1/1, July 1850-1/7, December 28, 1850. $2.00 a year. Started at 16 pp., and then dropped to 4 pp., with occasionally 8 pp. in the doubled-up later issues. Sunderland (1802-1885) says that this (together with its successor, The Spirit World, which continues the numbering of the Spiritual Philosopher) was the first spiritualist journal in the world-though initially Sunderland was skeptical of the role of spirits in the phenomena and only came to accept spiritualism in October 1850 after his daughter Margaretta (Mrs. Margaretta S. Cooper) had become a medium. Sunderland originally intended the journal as a replacement for the Univercoelum, and indeed he managed to attract many of the contributors to that journal, including A.J. Davis, M.W. Fernald, and William Fishbough. 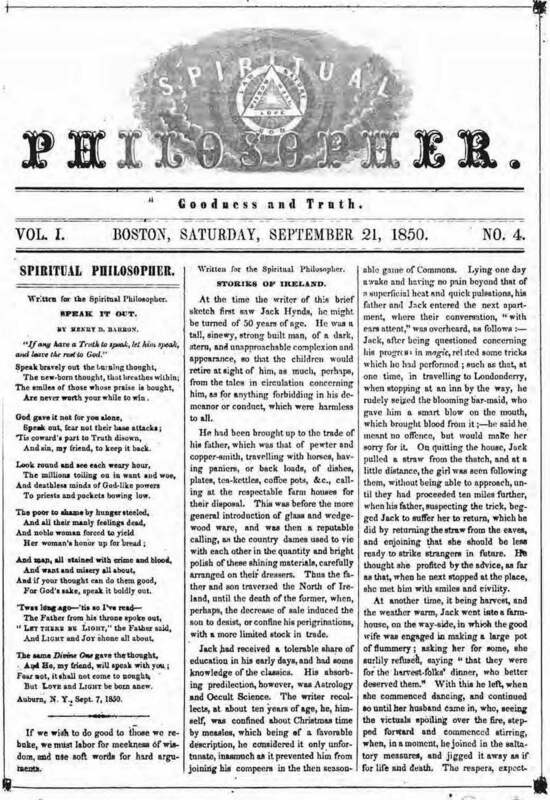 The journal was devoted to expositions of what Sunderland called "Pathetism"-his mixture of Mesmerism and phrenology-coupled with the Harmonial Philosophy and the phenomena of the first spiritualist circles. Sunderland notes that the "Spiritual Philosopher originated in the Spirit World, and was conducted under the direct supervision and advice of 'Hosts of Friends in the first, second, third, fourth, fifth, sixth, and seventh spheres above.'" Spiritual Philosopher 1/ 6 (October 19, 1850): 89. This expert advice was unavailing, and almost from the beginning the journal began to follow the familiar path of failing journals-combining issues and filling pages with miscellaneous items from the newspapers and long excerpts from other spiritualist publications. The journal ceased at the end of December 1850, despite Sunderland's guarantee in July that "we have made arrangements for its continued publication during the year. We have the means . . . ." "Continuance for One Year," Spiritual Philosopher 1/1 (July 1850): 10. From Sunderland's past performance with The Magnet it is possible that he terminated this journal and merely changed the name to The Spirit World in order to avoid his obligations to his lenders and patrons, but perhaps the transition was simply a name change. The general reform and socialist trends of the journal are illustrated by its reprinting of an article by George Lippard on the Brotherhood of the Union and by its inclusion in its final number of an article by P.J. Proudhon on the Coming Era. Sunderland went on to renounce spiritualism and ended up a materialist and atheist. See also The Magnet. Wisconsin Historical Society; NYPL; NY State Library; Harvard University; Skidmore, Lily Dale.